Scenarios, helps an administrator setting up diffrent predefined scenarios. Before any scenarios are configured this screen contains very little. As more and more scenarios are performed a list of scenarios will be displayed on this screen. Scenarios are categorised and are described in detail under it's own heading. To perform a Scenario click the plus, +, sign. Editing and deletion is done by selecting the scenario listed under a category. This is the default landing page. Create, edit and delete connections here. Both in and outbound. 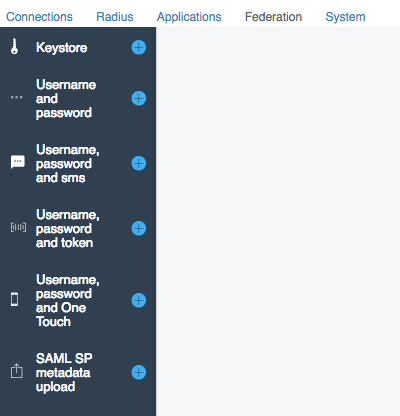 Radius scenarios lets an admin configure PhenixID server to act as an RADIUS server. Commonly used for protecting VPN. PhenixID comes with several administrative applications. Providing a quick, secure & easy deployment. MFA Admin & Self Service can be configured in many ways to fit each customers needs. MFA Admin let's an administrator activate tokens, setup emergency tokens etc while Self Service allows for end users to handle administration themselves. Depending on requirements configure one or both. Acting as an IDP (Identity Provider), the federation scenarios gets the system configured with MFA authentication and more within minutes. Global system settings are configured here. Message Gateway settings (SMS), SMTP and PhenixID One Touch settings that are used by other parts of the system.